You are here: Home / Challenges / Sweaty Betties Workout #5- Brutal Metabolic Workout! 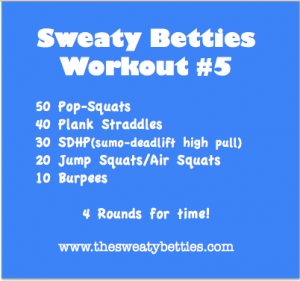 Sweaty Betties Workout #5- Brutal Metabolic Workout! It almost stop at the 2nd round..haha..
Oh my heck! I did it in 22:37. Not too bad considering I had kids interrupting me and trying to talk to me the whole time, lol. 27:18 for me…I can’t begin to explain how much I now dislike Plank Straddles. 😉 Love being pushed harder, looking forward to the next one!!! 17:04 for me! It’s a love, hate things:) I look forward to these workouts! Thanks!!!!! Oh My Goodness! Loved it/hated it. go,but it may help loosen those muscles. Thanks for the challenge! Hi Danny J! 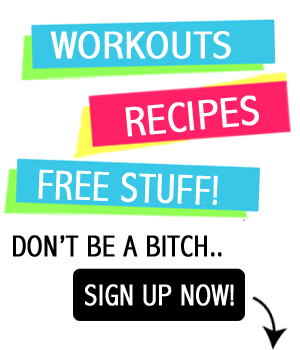 Are your workouts that you post something that you can do more than once throughout a week? P.S. Looking forward to your talk on improving your business as Personal Trainer! Wow finally tried this today. I have to say that was was one of the best home workouts I have gotten thus far. I was drenched by the end (is it bad I had to break often?) But I did do the 50,40,30,20,10 all 4 rounds. I have to say I’m not fond of pop squats…lol These are great keep it up!